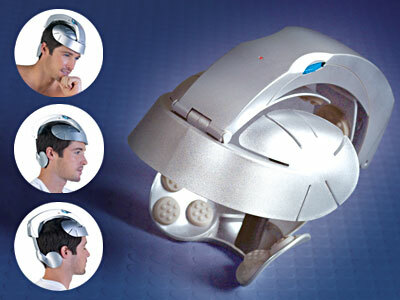 Brain Massager Good For Low Budget SciFi, Ridicule | OhGizmo! This dorky looking gadget called the Head Spa Massager “incorporates Japanese engineering and utilizes acupressure to relax and soothe your problems away. It’s like thousands of tiny fingers simultaneously massaging your scalp.” That sort of creeps me out a little bit, personally. The designers suggest using this thing “at your desk at work” or “on your morning commute in traffic,” which are great ideas if you want to look like a raving loony. It’s supposed to relieve stress by stimulating blood circulation to the brain, and incorporates a rechargeable battery so that you can take it everywhere and wear it all the time. $49.95. for men only or unisex ?